I’m very excited to have the opportunity to talk about your amazing brand Delight. What was the inspiration behind K’s Wors? As an enthusiastic ambassador for dazzling Southern African flavours, I’ve long been aware of the growing UK appetite for international cuisine. The growing artisan food movement in Great Britain has led to a re-evaluation of flavours, textures, best-in-class ingredients and a non-conveyor belt mindset. This refreshing outlook has since spread to looking beyond our borders for amazing overseas flavours that galvanise our taste buds. Sausages have an enviable pedigree and heritage in the UK and yet as hard as I searched I couldn’t find anything that captured the true ‘meat feast’ essence of the classic boerewors (up to 92% meat content). It frustrates me, that for all the depth of sausage choice in Britain, this is a food category that is still seen by many as a commodity, a sarnie fill, a cooked breakfast essential, a BBQ aperitif. My vision is to do my bit to reposition sausages as a key, weekly shopping decision that’s no longer prepared to sit on the edge of the plate – and don’t even get me started on ketchup! When you created the 1st batch were you nervous? Absolutely, a situation not helped by the sight of meat everywhere. The uncertainty of how it would turn out and the lack of experience about creating something could be scaled made the process especially nerve-racking. The first batch took more than 8 hours to make as we were figuring out a lot of things as we went along. We had our own notes open, a YouTube video and a friend on the phone who was experienced in sausage making. What has been the early reaction to K’s Wors? It’s very ‘early doors,’ we launch this October but I’ve deliberately made a point of trialling my recipes at a handful of ‘opinion-forming’ charity events and gatherings. It was the ‘off the Richter scale’ response to my boerewors at a Manchester charity fund raiser in 2016 that first made me think that I might be onto something! What did you do before K’s Wors & how has your previous experience contributed to your new brand launch? Friends and family would consider me a restless entrepreneur with very itchy feet. I’ve worked in the Civil Service these last 9 years (administrative officer) and yet at the same time completed an Open University diploma in English Law and set up an ‘urban demographic’ cleaning company. I don’t like to let the grass grow under my feet, which might explain how in 2016 I was fortunate enough to win the Black African Woman Rock award (female business person of the year). Food has always been close to my heart, so when the idea of a ‘best-in-class’Boerewors popped into my head I knew I was onto something. Do you think powerful & long lasting branding comes from building a lean organic business? I think brand sincerity and transparency sits at the centre of a successful brand. Consumers need to wholeheartedly believe the promise on offer. Should a moment ever come when your loyalists feel short-changed or misled, nothing you say or do will ever recover the situation. 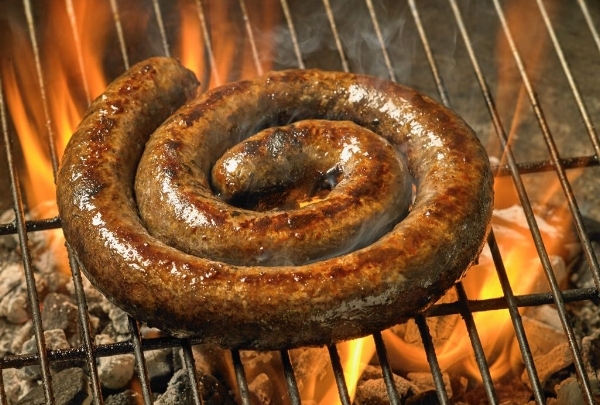 Boerewors in Southern Africa is part and parcel of those spontaneous, informal gatherings where friends & families gathered, where the braai burned intensely and impassioned, rhythmic music filled the air, which is why K’s Wors brand essence is all built around authentic, spicy & inner happiness. Feelings for the perfect boerewors run so high that Boerewors is a recipe jealously protected by South African law. How do You balance business/personal life? I have a very strong support network. I co-founded the business with my partner and everyone in the family has a role to play. Our oldest son is a keen photographer so he takes most of our products photos which we use on social media. Our 12 year old daughter helps with stock taking especially during the last summer holiday where we’ve had to send out a lot of samples. Our youngest is very good at spreading the word- she tells anyone who can listen that my mum and dad make the best Sausages! My mum is always on hand to help as well whenever needed. These may seem like small tasks but they make an incredible difference. Working as a family means we spend more time together and therefore we achieve the perfect work/life balance. What sets K’s Wors apart from its sausage peers? I think we’re the first company to try and extol ‘true’ brand attributes on boerewors in the UK. It’s also worth noting that my Zimbabwean roots combined with my co-founder/partner’s South African heritage means we’ve created boerewors that showcase the very best of Southern African cuisine. It’s also rather reassuring that we’ve won three Great Taste awards before we rolled out onto the national stage which must be a first! In 2019 our brand will also benefit from the collective might of the BBC as one of the case study brands that’s been chosen to underline the difficulties a young brand faces securing ‘meaningful ‘ financial backing in the ‘early’ years. What advice would you give entrepreneurs getting ready to pitch to the trade? Know your heart and stand your ground. Early on in our journey I sought out one of the ‘leading lights’ in the UK sausage scene for guidance and advice and was surprised about just how negative and dismissive he was. I appreciate that in one sense we’re ever so slightly treading on his toes, (but not really) but felt in his capacity as a real ‘influencer,’ he could have shared some positivity. Whatever happens to K’s Wors over the coming months and years, I will always look for the good in any start-up that comes to me for advice. Was there ever a point where you felt you’d bitten off more than you can chew & how did you get past these moments of doubt? December 2017, after spending all of our savings and credit cards on new product development, consultation and research I was so broke that I couldn’t afford to pay for the kids’ school meals or even put fuel in my car to go to meetings. I was stuck with a great product which I had no idea how I was going to take it to market. It was coming close to Christmas and it dawned on me that not only had the kids not had any birthday presents that year, they were not going to have Christmas presents either! I still needed capital to launch the product. It all seemed far too expensive and impossible that I was ready to throw in the towel. Simon Sinek’s TED Talk ‘Start With Why’ helped me to change my focus and find a strong tone of voice. I discovered my WHY and everything changed. What’s your over-arching vision for K’s Wors? Are there future plans afoot to diversify the K’s Wors portfolio? We have plans to bring to market cooking sauces, sprinkles/seasoning, marinades, condiments flavoured cooking oils, made for drink snacks and cooking accessories.